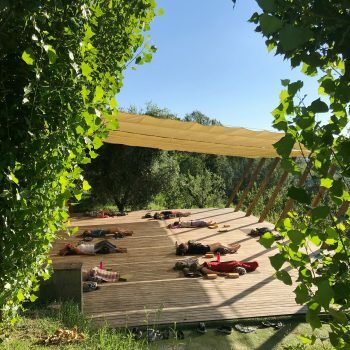 A serene seven day yoga retreat experience in the tranquil Sabine Hills of Lazio, Italy. A stunning location, INCREDIBLE people and FABULOUS food! Can we go back tomorrow? Every minute is worth it! Invigorated, revitalised and now floating back down to earth - wow! ~ Michelle B. All yoga equipment including mats, blocks, straps and big comfy bolsters. 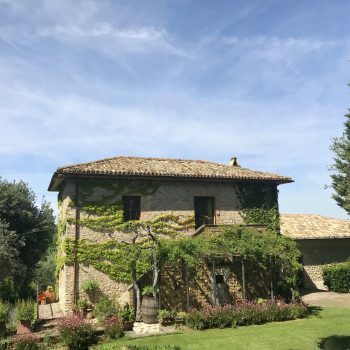 On your retreat in Italy you’ll stay in a beautiful 17th-century stone villa surrounded by flower laden vines with simple, natural style bedrooms, that feel calm, cool and restful. If you’re a nature loving yogi with a sense of adventure stay in one of the yurts instead! With its spectacular views and magical setting, our retreat villa lies in the midst of the Italian countryside less than an hour from Rome. There are three wonderful terraces from where you’ll enjoy breathtaking sunsets, beautiful meals and star filled skies. You can bask in the sunshine by the pool on one of the vine shaded luxury pool beds then cool off under the waterfall shower. The pool is fantastic, with comfy loungers and shady spots. It’s surrounded by olive trees and a pool side tea station with a pick your own herb garden! 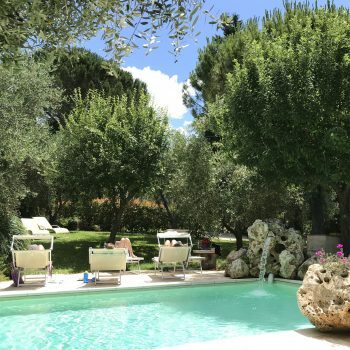 You can spend hours by the pool, just resting, reading and swimming.Or wander among the garden’s fruit trees, olive groves, lily ponds and natural springs and pick your favourite hammock, terrace or tree house to relax in. 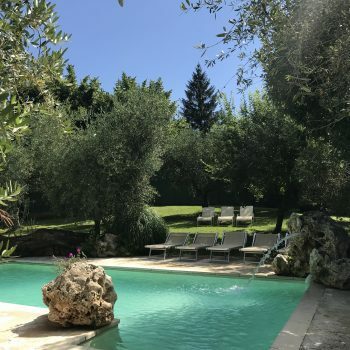 You can set out directly from the villa in to the incredible countryside and enjoy the tranquil beauty of your surroundings as you follow one of the many walking routes that lead to ancient villages and waterfalls, past olive groves, vineyards and meadows of wildflowers. It’s a 30 minute walk to the local hill-top town, where you can amble through picturesque cobbled streets, buy fresh peaches and giant tomatoes, watch the world go by from the terrace of a tiny local cafe, or enjoy the best gelato you’ve ever tasted! On Friday evening we’ll all go out to watch the sunset in Casperia (a beautiful small town of cobbled streets, bright plant pots and tiny shops) before a delicious meal in a fantastic local restaurant. There will also be the option to take a day trip to Orvieto where you can explore the incredible architecture, piazzas, fountains, cute cafes and eat more gelato with your new friends. Start the day with a vibrant vinyasa flow yoga class. This fluid, dynamic and invigorating form of yoga will leave you energised and glowing! In the afternoon you’ll love the deeply calming and yin & restorative yoga classes. You’ll float out of these classes feeling revitalised and relaxed. Your yoga classes will be filled with accessible teachings and ideas to inspire you and help you reconnect with what’s important to you and to feel so good about yourself. You’ll also experience meditation sessions and guided relaxations to leave you feeling serene, centered and with a new perspective on meditation. There are 2 stunning spaces for yoga; a light and spacious indoor studio and an outdoor yoga deck. 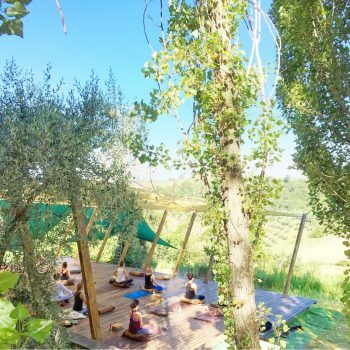 The yoga deck is perfectly positioned on the hillside, with panoramic views. It’s tranquil, serene and stunning at sunrise and sunset. You’ve never seen a yoga space like it! It feels so great to start each day on the deck with energising vinyasa flow and to return every afternoon to relax completely with a yin yoga class. Both our studios are fully equipped with yoga props (blocks, blankets, mats, bolsters and straps). Over the retreat there will be 10 90 minute yoga classes. Your yoga teacher, and Shine Yoga founder, Jennifer Austin passionately believes that yoga classes should feel fun, relaxed and inclusive. She loves to create exciting, flowing, original classes with careful sequencing in a joyful atmosphere. Her classes include laughter, new challenges, wisdom, music, meditation, poetry and anything else she can think of to make you feel really good. She can’t wait to meet you! I had the most special and inspiring week in Italy with Shine Yoga. Jen is a natural teacher. The classes were challenging but incredibly fun and spiritual experience at the same time. ~ Tessa G.
Indulge in delicious, nutritious, vegetarian dishes from the finest and freshest local produce, including loads of fresh fruit and vegetables from our own garden. For a whole week you won’t have to spend a moment thinking about shopping, cooking or what you should be eating. You’ll enjoy 3 beautiful nourishing meals daily seated around our alfresco dining table and on one evening we will head out to experience the local restaurants and some of the world’s best cuisine. All the food will be vegetarian and if you have any dietary requirements or requests the chefs are brilliant at catering for these too. Throughout the day you’ll be able to help yourself to tea and coffee at our outdoor tea station beside the pool. You can even create your own fresh herbal teas by picking your favourites from the poolside herb garden. Early Bird Special Offer! £50 off per person. Booking must be made by 1st September 2018. Super Early Bird Special. £100 off! Only 1 yurt available at this price. Super Early Bird Special. £100 off! Only 1 room available at this price. To book your place on the retreat just email jen@shineyogaretreats.com. Jen is also really happy to help answer any questions you have about room options, travel plans or anything at all to do with the retreat. She can’t wait to hear from you! Absolutely, lots of guests on every retreat arrive independently. There is a warm, kind and friendly atmosphere with communal activities and plenty of opportunity for you to take some quiet time for yourself too. You can choose between booking your own private room/yurt or stay in a shared room with one other person. Just email jen@shineyogaretreats.com and Jen will help you find the best room option for you. 7 nights accommodation in the enchanting retreat villa. Beautiful large breakfast and lunch every day plus 6 delicious dinners. Unlimited tea, coffee and herb teas. All yoga equipment including mats, blocks, straps and big, comfy bolsters. 1 meal out at a local restaurant. Additional activities and day trips. Yes, we eat our meals together and people tend to group together to participate in activities, take a walk or just have a nice chat but everyone also has time to themselves to read, take a stroll through the gardens, find a beautiful spot to meditate or nap in their room. Yes, it’s a scenic 30 minute walk to the local village to explore the local cafes, enjoy the incredible views and experience local life. Arrive any time after 4.30pm on Saturday. Dinner will be served between 7pm – 8pm on Saturday. The first yoga class of the week will be on the Sunday morning. Checkout is at 10am on the following Saturday. The yoga retreat is within easy access of Rome and its airports. There are a huge range of flight options to choose from, just take a look on Skyscanner to see for yourself! Before you book your flights please email jen@shineyogaretreats.com so Jen can help to suggest the best flights to meet the group transfer to and from the airport. For those who wish to be independent or to explore the area you could choose to hire a car at the airport. We’ll then send you through detailed directions of how to find the retreat villa! The nearest train station is Stimigliano Train Station about 20 minutes drive from the retreat. If you are travelling by train from Fiumicino airport, you can take a train from directly inside the airport. Go to the train station inside the airport. Follow the signs to the ‘Stazione’. Buy a €11 ticket for Stimigliano (the Orte train). The Orte trains leave at 58 minutes past the hour and takes 1 hour and 47 minutes to Stimigliano. Before you reach the platform validate your ticket by inserting it in one of the yellow machines to be stamped. When you know which train you will be on, call us on +39 340 3876028. The stations are not well signposted so be alert and aware of the time. Take the airport bus to Termini station in the centre of Rome. In Termini follow signs to the Metro (‘M’) and take Linea B to Tiburtina Station (4 stops). At Tiburtina, buy a ticket to Stimigliano (the Orte train) for €3.60. The Orte trains leave at 47 minutes past the hour. which train you will be on. (After 10.00pm and before 7.00am the minimum charge is €35).